Today, I made this glorious buckwheat sourdough bread! I used 3 organic flours in here to make this stunning beauty!!! Can you guess which one’s? Have a slice with me, smeared with butter, of course! And to top that with a good slice of salami or young cheese,…please! 😉 My yummy bread was huge: 1221 gr! Ooh yes! Take Kenwood machine, place dough hook in & to the fitted bowl, add all ingredients in this order in it. Mix on medium speed for 3 minutes. When dough has formed, take out & knead a few minutes with your hands. See that all the hazelnuts are well spread into the dough. You don’t need to add any flour. Knead until it is elastic & well-kneaded. Form a ball-shaped dough & place into an oiled big bowl. I place another big bowl over it. I place it into a preheated oven on 150°C for 10 minutes that I have turned off. Leave to double in size. This took my dough 90 minutes. Take dough out of the bowl & knock back the air out of the dough. Knead for 1 minutes & shape like you want. 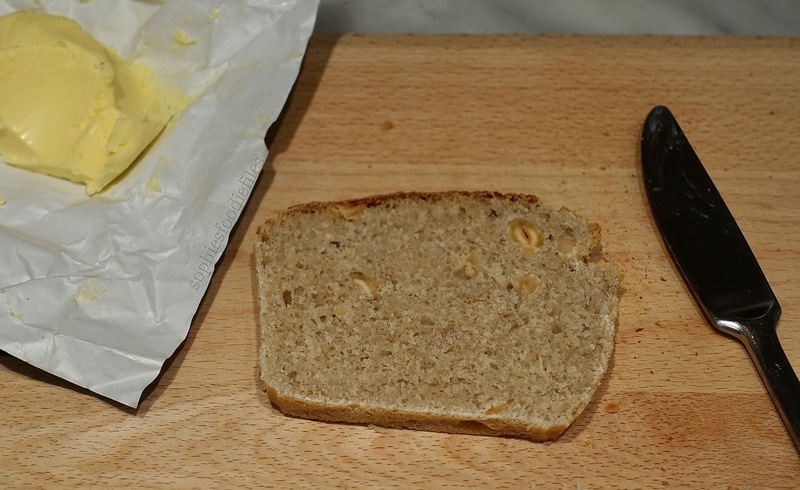 I made a loner thicker shape & put it into my silicon bread tin. I place an upside down big bowl over it & placed it into the warm, turned off oven to double in side for the last rise. whole-wheat spelt rye sourdough bread! Rye Spelt Wheat Sourdough Bread studded with Hazelnuts! 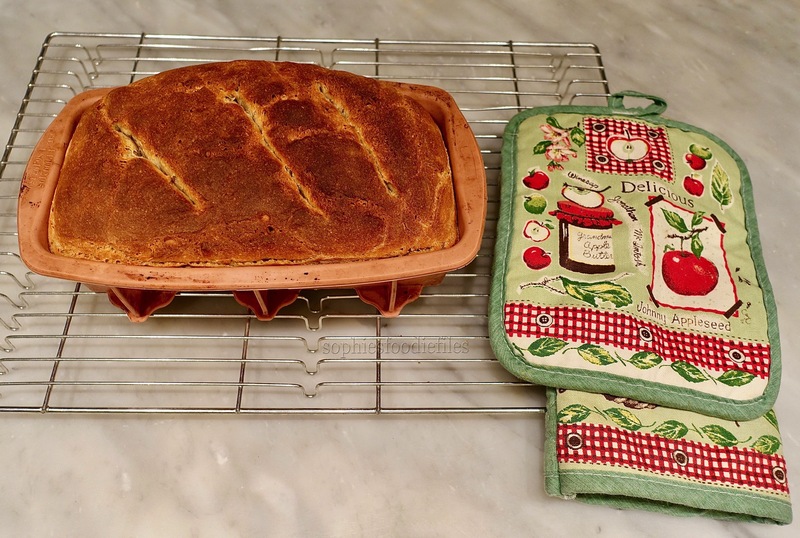 Semi-Wholegrain Sourdough Bread baked in a closed Creuset pot! Previous Post Gluten-free Festive Buckwheat Cookies! Next Post I introduce a new tag: Very easy recipes! Ooh yes it is truly wonderful & day to make too! 🙂 Enjoy, Camie! Ooh yes, it is! 🙂 Great with salami & butter! Looks hearty, nutritious and delicious! Really lovely bread with the added nutty buckwheat flavour in here! Appears to be a wonderful loaf of bread! It is! 2 slices really fill you up for many hours! What a beautiful loaf of bread Sophie–my favorite thing to eat in the world is bread and butter!! Larry and I listened to a podcast recently on sourdough and thye interviewed a man who had a sourdough starter collection in Belgium!! It was really fascinating– the history of sourdough starters, long before commercial yeast. Anyway, this bread looks delicious! hugs hugs! Thank you! I will have two slices! It looks gorgeous! Thanks so much! Happy 2018 to you! And to you Sophie !